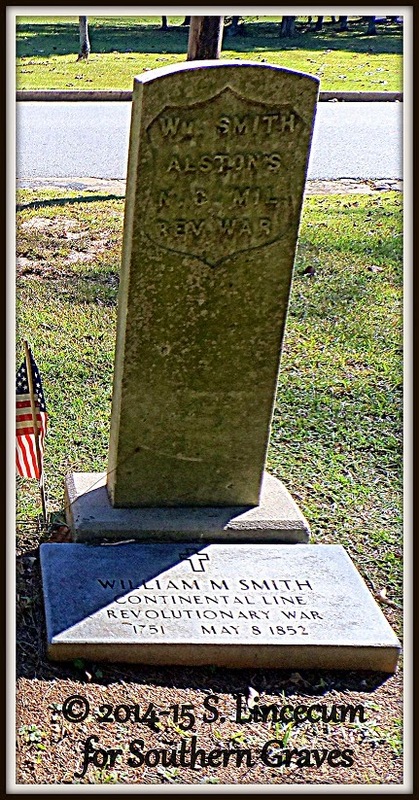 From an obscure grave in the county [Coweta] the remains of William Smith, another soldier of the first war for independence, were brought to Newnan some time ago and re-interred in the Confederate burial-ground, in the southeast corner of Oak Hill. He was given the sobriquet of "Hell Nation", a somewhat descriptive title which may indicate the fiery quality of his valor. Mr. Smith died at the age of 81. He enlisted in Moore County, N.C., and was granted a pension on September 3, 1832. I visited the final, final resting place of Mr. Smith in October of last year. When putting an image of the stone with the history by Mr. Knight, I noticed a bit of an issue. The older military stone for Mr. Smith, complete with a recessed shield, simply provides he was a member of Alston's N.C. Mil., Rev. War. The newer military stone adds the phrase "Continental Line" with a birth year of 1751, and a death date of 8 May 1852.